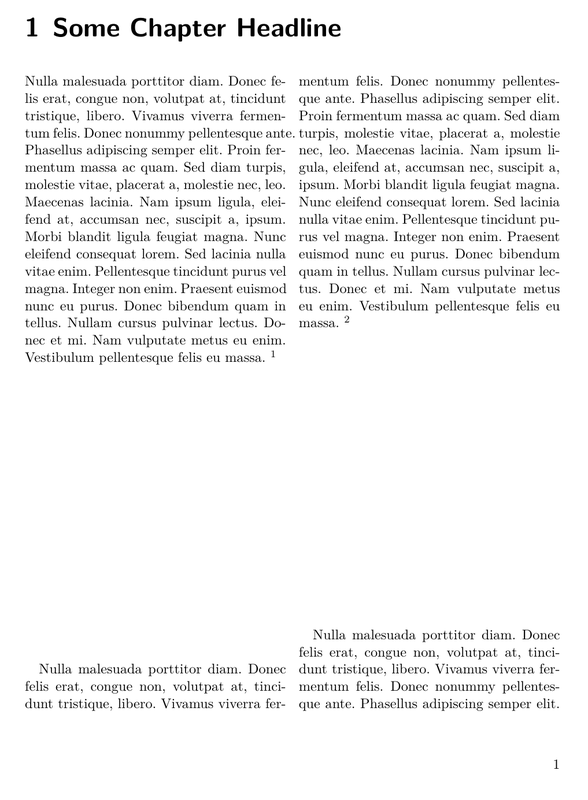 I'm trying to typeset footnotes with the excellent reledmac package in a two-columned document that uses the ltxgrid package from revtex. % ltxgrid would typeset them without reledmac! Is there any way I can "trigger" the footnote output routine of reledmac at the right point by patching some part of ltxgrid? Or do you have any other idea? addendum: As I notice, the problem is not specific to using \twocolumngrid. It would also appear in \onecolumngrid. Browse other questions tagged footnotes two-column reledmac ltxgrid or ask your own question. How do I reset the footnote cross-referencing counter for each chapter? Reledmac: how to use modified stanza lables as footnotes? how to use \twocolumn in amsart document class in latex?